The key jacket for this Spring/ Summer 2011 is a notched collar blazer. Eileen Fisher has picked out 3 versions. All have collar notch at front neck level. Good if you want to draw attention up to your face. All have similar shape and angle of notch. In some seasons there can be big changes in these, but a simple notch is popular this year. And lapels that are 1/3 to 1/2 the width along the shoulders to the armhole. All of them are loose enough to layer. While many jacket patterns are more fitted and meant to be worn closed, with perhaps only a camisole under. As I never wear a blazer myself, I used to think a blazer is a blazer is a blazer. Notched lapel collar, fitted sleeves, single breasted, boxy shape. Well, that’s in women’s clothing. In men’s clothing it’s a similar shape but usually navy fabric with brass buttons and patch pockets. Or in sports club or school colours. But in women’s fashion, there’s actually a wide variety of style details. Round or square corners ? Two of these jackets have square and one has rounded corners, so choose which is best for you. Are your body lines straight or curved ? Is it your style to be crisp or soft ? And some stylists say square corners make you look slimmer. . .
A wide variety of lapel widths are fashionable at the moment. Though Eileen Fisher hasn’t featured one, shoulder-width lapels are also current if that looks good on you. For me it’s not a simple choice. Wide lapels give me upper body emphasis, which I need as I’m small busted and wide hipped. And they visually strengthen my sloping shoulders. But a slim lapel adds a vertical line, which I need as I’m short waisted. Which looks best on you ? These styles all have collar and lapels the same width. This is classic style, but it isn’t essential, it’s a design decision. Also the edges of collar and lapel are straight. That’s another style feature which is current classic, though there are many patterns with curved lapels. X or Y neckline ? In these examples, the 3 button style has a front edge Y shape, and the 1-button styles have a front opening X shape, which I talked about in my shawl collar blazer post. Would you look better with the front cut away below the lowest button ? Soft roll or firmly pressed edge to the collar fold ? Which is more to your personal taste ? Which flatters your body shape ? Do you want to look more formal or more casual ? Style, location, angle of pockets ? Men’s blazers have patch pockets. Women can use nearly every pocket style on a blazer : patch, in-seam (perhaps with hidden zip), flap, single welt, double welt. (An exposed zip is more edgey than classic. And pleated or bellows pockets are more safari/ artisan.) It’s possible to go on at length about pockets. There’s a lovely old book, ‘Just Pockets’ by Patricia Moyes. Start from the simplest jacket pattern and make multiple versions which look different because of the pockets. Do you do the sort of work where you have your back to onlookers, so jackets with back interest would be a good idea ? Or do you usually sit down, so need a plain back that doesn’t crush easily ? 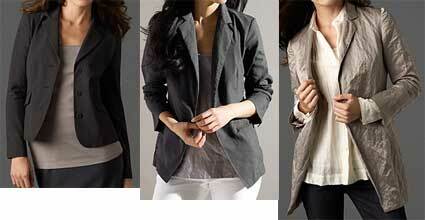 One of these Eileen Fisher jackets emphasises the curved shaping of multiple princess seams at the back. Another has an inverted pleat at centre back. People round here are wearing jackets with multiple seams or inverted pleats at the back, often below a yoke, and with a 2-button tab at waist level. Perhaps Project Runway Simplicity 2810. It’s relatively easy to leave out the lining of a lined jacket – unless there’s a lot of inner structure to hide. Adding a lining to an unlined pattern is not difficult once you know how. See oop book ‘Easy Guide to sewing linings’ by Connie Long. There are some style elements which it’s best to leave as they are on a pattern, as they’re difficult to change unless you know what you’re doing. These 3 jackets all have the notch at front neck level. But it has recently been fashionable to have notches much lower, even at bust or waist level. Particularly on ‘boyfriend’ jackets. Being closely analytic, there are 3 angles at the notch – the collar corner, the notch, and the lapel corner. And all 3 are design decisions. The Eileen Fisher jackets have the corner angles close to square. This is the classic choice. On these jackets, you have a choice of folding back the collar from bust level or waist level. Which is more flattering on you ? I’m best with a lapel down to waist level. That gives me a vertical line on my short waisted upper body. And a lapel folding out from bust level draws attention to the fact that I haven’t got one. Does one of these break points make you look or feel older/ younger ? slimmer/ wider ? larger/ smaller cup size ? In the example jackets, the lapel from bust level goes with the shortest length jacket, but that isn’t necessary. On these jackets the button positions are simple and classic : a single button at waist level, or three buttons spaced from bust to waist level. It’s easy to change the number and position of the buttons within the space available. This is the strip where the centre fronts overlap. The top of the strip available for closures is just below the break point where the collar turns out. The bottom of the strip depends on whether or not the lower jacket is cut away. Once these are set it’s relatively easy to change how high or low the top and bottom button are, and how widely spaced they are. No doubt if you’re generous busted you’re already know it’s best to have a button level with the bust point, if that area is buttoned over. Choice of 3 buttons or 1 (or 2 ?). Which is best for you ? This depends on details of your body shape (and how fitted the style is, just to complicate things). Perhaps do some snoop shopping of jackets. Which button layouts make you look longer/ shorter waisted ? Which make you look larger/ smaller busted ? Which make you look more efficient/ more relaxed ? One button needn’t be a waist level. 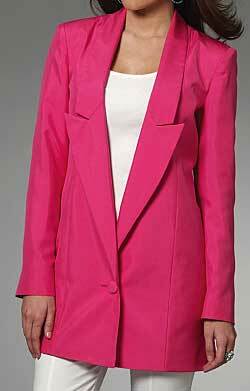 There are several Simplicity jacket patterns with 1 button at bust level. This was all getting a bit much. So I’ve put some comments about notched collar blazer patterns and sewing advice in another post. And not to worry if notched collar blazers are not your style. Some people love them, but they’re not for me. I do wear trenchcoat styles, which are also current. Not at all the same as a blazer. Double breasted, wide lapels, closing up to the neck, wide collar based on a band, added yokes for shoulder emphasis. There are three other key jacket styles picked out by Eileen Fisher for this season (cascade, collarless, and biker/aviator). I’m planning a post on them too. This entry was posted on March 26, 2011 at 9:56 am and is filed under body shape, current fashion. You can subscribe via RSS 2.0 feed to this post's comments. Both comments and pings are currently closed. Hey glad to know I’m right on the mark! I just finished a blazer. Although I missed the location of the notch, I did pay attention to length and pockets. My particular pattern had darts available which I used. I like the classic boxy blazer, but I’ve lost enough weight to want to show my newly developing waist. Love these analysis. I know it gets involved and confusing when there are so many different designers trying to make their line distinctive. Thanks Bev – I love your red jacket 😀 and I was interested in your comments about making big facings instead of a lining. And your shawl collar vest ! Sometimes I think I’m going on too much about all the details, but it’s surprising how much they can affect whether a project is successful or not. It’s good to develop an eye for details of what works well on you, not just going for a general style like ‘blazer’ or ‘shirt’. I am not a “blazer person,” but I bought a RTW blazer made in a dark denim-look heavy knit fabric. It is interfaced but not lined, and is machine washable (I have small children). Because if the knit fabric, I feel much more comfortable in this style than I would otherwise. I also get many complements on my “soft jacket.” I plan to make one that fits better in a different color knit. Good point Melanie – I tend to forget to mention knits !